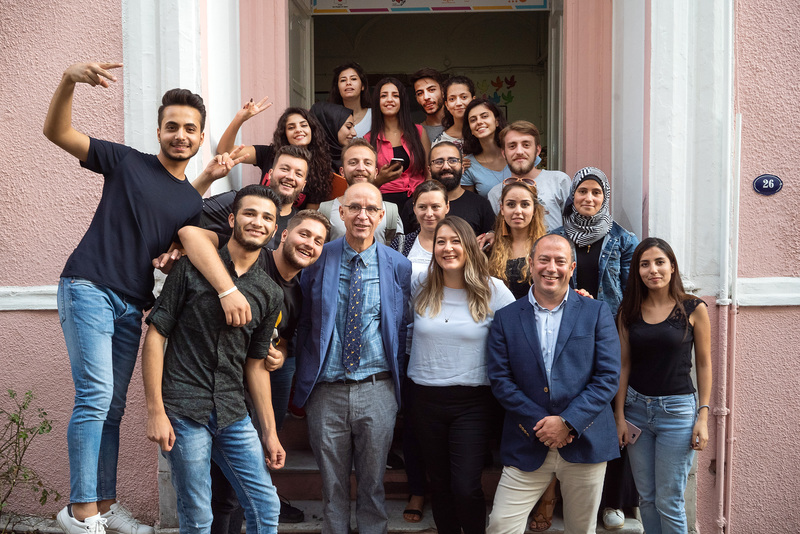 20 September 2018, İzmir –Edis Görgülü, United Nations Population Fund (UNFPA) Spokesperson paid a visit to the Bulut Öncü Youth Centre located in İzmir. 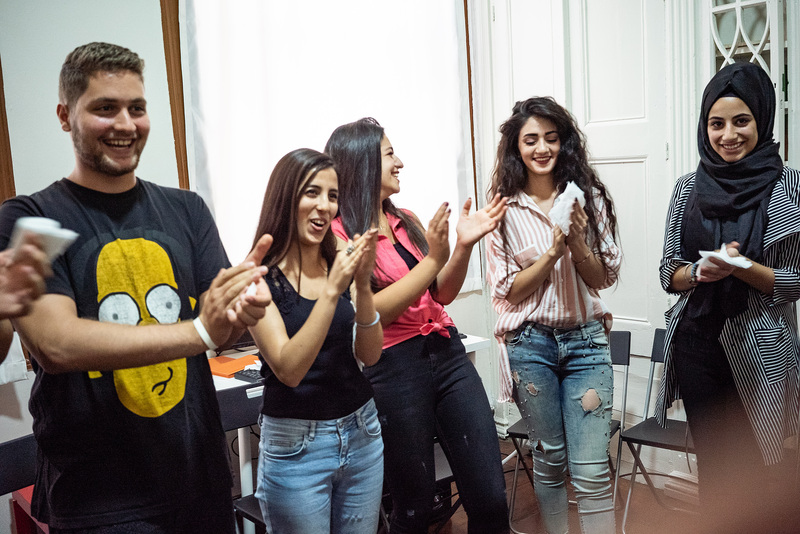 The centre run by the Community Volunteers Foundation, one of the implementing partners of UNFPA, serves young people from Syria, delivering them several services with respect to psycho-social counselling, social integration and reproductive health. The centre that was opened in 2017 and is financed by the Japanese Government. Birleşmiş Milletler Nüfus Fonu Sözcüsü Edis Görgülü, gençlik merkezini kullanan gençler ile birlikte. Bahri Telli, General Coordinator of the Project of Support for Young Immigrants executed by the Community Volunteers Foundation, informed Edis that Turkey hosts 3.6 million Syrians refugee among them 1.5 of them are between 15-30 years of age. Telli further told Edis that the Youth Centre in İzmir provides services to 100-150 beneficiaries every day, enabling young people in this age group to access to the services they need regarding psychological support, social integration and healthcare. Birleşmiş Milletler Nüfus Fonu Sözcüsü Edis Görgülü, Bulut Öncü Gençlik Merkezi hakkında Toplum Gönüllüleri Vakfı Genç Mültecileri Destekleme Projesi Genel Koordinatörü Bahri Telli ve merkeze sağlık çalışanı Ezgi Bolat'tan bilgi alıyor. Edis, a famous pop singer in Turkey, was also informed that young people who come to the centre with complaints concerning violence and trauma recover in a relatively shorter time of recovery and cultural adaptation thanks to the health services delivered by the centre. Edis was also told that, in an effort to increase their capacity to cope with the trauma they experienced, young people are empowered through the healing power of music workshops held in the centre. Stating that the psychological problems and those regarding social adaptation of the young people who seek counselling in the centre originate from the traumas they have experienced, Edis added: “I have also made it a mission, as a young person, to raise awareness about the traumas arising from the violence. It is my mission to be a spokesperson providing a listening ear to the dreams young people here cherish for the future and to contribute to their recovery process. I am very happy to be here and to get to know you all’’. Birleşmiş Milletler Nüfus Fonu Sözcüsü Edis Görgülü, gençlik merkezindeki akran eğitimini gözlemliyor. Edis also participated in the peer training session provided in the centre and received information from instructors and participants. He also had opportunity to converse with the young people benefitting from the centre and talked with them over their needs, training processes and expectations into the future. When informed about the Turkish courses provided within the education programme in the centre, Edis said that he was impressed with the good command of Turkish by the Syrian youngsters. In the conversation he had with the young people, Edis Görgülü added: “I am 27 years of age. I have been in the music sector since I was 24 years old. The social adaptation process of the young people from Syria is very important for me. I think that this is a sensitive issue required to be addressed with solid projects. Artists will have valuable contributions in this respect in terms of creating awareness and establishing a mutual understanding”. Speaking about the condition of the Syrian youth who had to flee from their homeland, Edis Görgülü said: “I know well what it means to feel out of place, like an outsider. So long as a common language is built, your home is everywhere. The history of this land is also your history now’’. The successful artist Edis, who was informed that young people, who receive support from the centre with respect to the application and registration process to continue their education in a university, work at the same time in the textile sector, encouraged young people to continue in their educational path. Birleşmiş Milletler Nüfus Fonu Sözcüsü Edis Görgülü, Birleşmiş Milletler Nüfus Fonu (UNFPA) Türkiye Temsilcisi Karl Kulessa, UNFPA İnsani Yardım Program Müdürü Nazlı Moral, UNFPA İzmir Saha Çalışanı Cahide Sarıokur, Toplum Gönüllüleri Vakfı Genç Mültecileri Destekleme Projesi Genel Koordinatörü Bahri Telli, Toplum Gönüllüleri Vakfı Akran Eğitmeni Lemi Karaca ve merkez çalışanları Ebru Doğru ile Ezgi Bolat'la. Mr. Karl Kulessa, Representative of UNFPA in Turkey, who was also present during the visit of Edis in the Bulut Öncü Youth Centre, said: “I thank Edis that he could spare some time for us from his busy schedule to get involved in and contribute to our activities we execute with young people from Syria. The Syrian youth benefitting from our services are enthusiastic to host the visit of Edis; the interest shown toward them does always motivate these young people. In our centre we utilise music to manage the strain arising from traumatic experiences and to smooth the adaptation process. Artists like Edis become a part of this process with their creations’’. Birleşmiş Milletler Nüfus Fonu'nun Japonya Hükümeti finansal destekleri ve Toplum Gönüllüleri Vakfı yürütücü ortaklığında hizmet verdiği Bulut Öncü Gençlik Merkezi'nin kullanıcıları akran eğitimi sırasında. There was also a surprise waiting for the young people from Syria, who had the chance to watch Edis for the first time in his concert in İzmir. In his speech during the break of the concert that took place in a warm atmosphere, Edis addressed both the staff of the centre and the young people from Syria. Awakening a great applause among the audience, he spoke of his function as spokesperson for the United Nations Population Fund, underlining that he is involved in significant projects aiming to eliminate all types of violence against women and to abolish child marriages, and to ensure the social adaptation of the young people from Syria and to raise awareness about reproductive health. Edis also briefly referred to his visit to the centre during the day, mentioning the projects jointly executed by the United Nations Population Fund and the Community Volunteers Foundation to ensure the social adaptation of the young people from Syria. Addressing Syrian youth in a brief message of support, Edis said: ‘’You should continue to remain a part of our society here; we stand with you, you are always in our hearts’’. Birleşmiş Milletler Nüfus Fonu'nun Toplum Gönüllüleri Vakfı yürütücü ortaklığında hizmet verdiği merkezi kullanan gençler ve çalışanlar. Birleşmiş Milletler Nüfus Fonu Sözcüsü Edis Görgülü, merkez kullanıcılarının çocuklarıyla birlikte.